I was expecting full winter trail conditions and was not disappointed. The snow depth is between two and four feet pretty much everywhere but fortunately was well packed on the trail. I found that having Yak Trax and a pair of trekking poles was indispensable throughout the approach. The section up to Emerald was pretty straightforward but above that was a bit more involved. If you head up the first switchback to Lake Haiyaha, note that there is a specific wind-formed ridge of snow that cuts off the usual trail, making for 75 degree frontpointing traversing moves. Better to go west a bit on the lake and head straight up through the trees. The remainder was easy enough except of course for the super-exposed slabs near the end. Take care here. Without crampons or other similar footgear like Micro Spikes or Yak Trax, they could be very dangerous, especially going down. Definitely a bit alpine up there. I was also expecting Lower Chaos to be filled in and was not disappointed here either. The two warm-up boulders were almost completely covered as was the Bush Pilot boulder and European Human Being. The Gobot area is also totally submerged. The tip of the Centaur Boulder was exposed but not worth digging out yet. 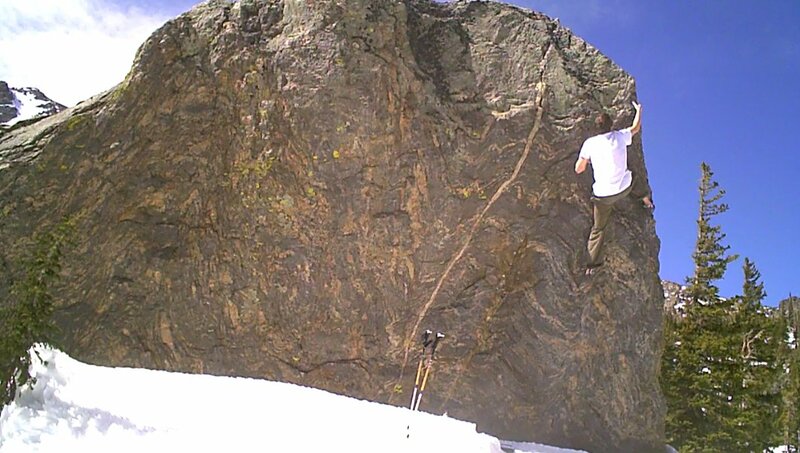 However the top of the Skyscraper boulder was exposed enough to make a perfect warm-up on the last crux section. Even with 15-20 feet of snow, this felt like a fairly exposed problem. Whether I will ever have the moxie to do the whole thing is an open question. However it felt great to top out and look out across the glistening ice that covered Lake Haiyaha. The Skyscraper boulder was not really the reason I thought the hike might be worth it. A couple of season's observations had me thinking that a project of mine, Element of Surprise, might be climbable early in the season. This south-facing boulder soaks up sun making it an unlikely proposition for the summer months. It also faces a bit west making it less likely to accumulate the snow that blows down from the upper canyon. A few minutes hike from the Skyscraper Boulder validated this theory. Sheltered from a stiff breeze coming from the west and basking in full sun, the boulder was totally climbable and I worked out all the moves again, wishing I had brought another pad, owing to a relatively complex landing. Most Chaos regulars tend to shy away from this problem, probably because it is very thin and super sharp, as well as very technical. I will be back on it however as soon as I can, since late winter/spring conditions are best for this crimping testpiece. So the verdict? Lower is pretty much closed out. Tommy's Arete could be dug out and made climbable pretty quickly but it would be pretty cold. Virtually everything else will have to wait a long while. Upper Chaos holds its own secrets but I hope to be up there to investigate soon. My guess is that for most, it is not worth heading up to Chaos for the next month or two. The snow pack is substantial and March and April typically see a lot of additional snow. But for me it was a great opportunity to get out of town a bit, get thrashed on a proper approach hike, and breathe the thin clear air of RMNP among a solitude broken only by the wind and the gentle whisper of a raven's wings flapping overhead. It's good to be be back up there again. Yet again, I feel compelled to note that what magazines, marketers, sponsored climbers and bloggers do affects my climbing not in the slightest. Neither shenanigans nor prose nor ads can persuade me that there is anything wrong at all with my climbing... other than that maybe I don't do it enough. To claim otherwise is just like saying the marriage of two gay guys in Vermont somehow affects my own. It simply isn't true. 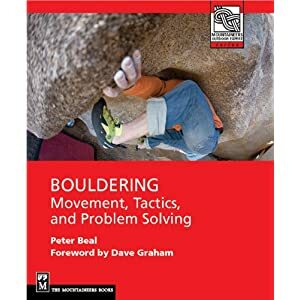 This goes out to the general climbing blog/forum community (if such a thing actually exists): there is nothing wrong with climbing unless you let it be so. In the meantime, the rest of us will happily continue to do what we've been doing all along. This piece was, however, written beautifully. You've got a lot of obvious talent. Sell, Sell, Sell: Is There an Alternative?